Offering you a complete choice of products which include films and sheets pvc compound. PVC Compound for Films and sheets offered by us are well known as a soft, semi rigid & rigid film compounds. These are widely used in photo albums, stationery, confectioneries & lamination, luggage liners blister films & sheets for vacuum forming, thermoforming and pharmaceutical packaging. 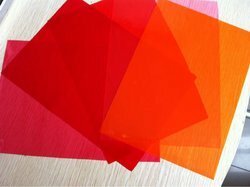 These PVC films are available in various colors as per the client’s requirements.